– 4′ of in-feed conveyor included. Additional sections available. Available Sizes: 16″ – 30″ Widths – Up to 1″ Thickness. OMRON Touch-Screen Controller: Multi-program memory features basic nesting ability, multiple plate cut patterns and on-screen keyboard. The SUNRISE automatic CNC plate shear system is available as a factory-installed addition to any SUNRISE dual-cylinder ironworker. Simple touch-screen programming is standard. 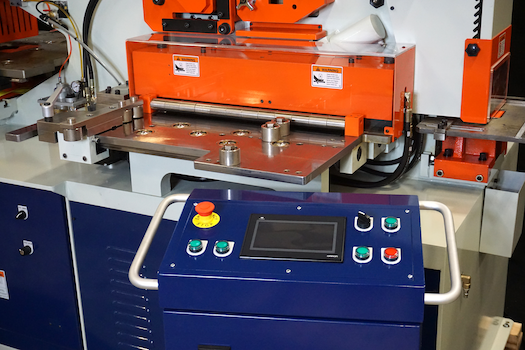 The CNC plate shear system eliminates manual shearing time and plate positioning. The operator has full control to input material length, cut lengths and number of pieces needed. The system automatically processes the plate to length featuring knurled drive rollers, hydraulic hold-down and proximity sensors to achieve the highest quality parts. Working with Trilogy Machinery has been a pleasure. Your prompt service is greatly appreciated and has been most helpful as we have implemented the new Sunrise Ironworker. The automated systems have proven to be exceedingly useful and have saved countless thousands of manhours just in the first year of use. We run the machine (shear and punch) nearly 8 hours a day 5 days a week and it has become the main workhorse for our facility.